Yes, this sticks were used by city inhabitants to mark where did they leave their cars. The municipal services warned people that everyone needs to mark his car, so that he could find it in the morning and so that if some municipal ambulance would try to crawl its way through the streets won’t hit it occasionally. I mean an ambulance like this. I cannot imagine what would happen if so much snow would fall where I am. When there is 4 cm of snow the people are freaking out on the roads. Driving 50kph where 90 or even 120 kph. even when he digs the car out, where will he drive? there are no roads! He’s taking out the battery and taking it home. It’s quite comman in old Soviet days when you park your car. You take the battery home. Charge it up. Then the next morning come back and put it in and drive away. Batteries were not as good as Western, and it was just damn cold for them to not discharge. Now batteries are better but it’s still useful to bring them home. There are also timers to switch engine on and off to warm them, say, every 10 minutes every hour so it’s not too cold, but that trick is useless for really bad weather. 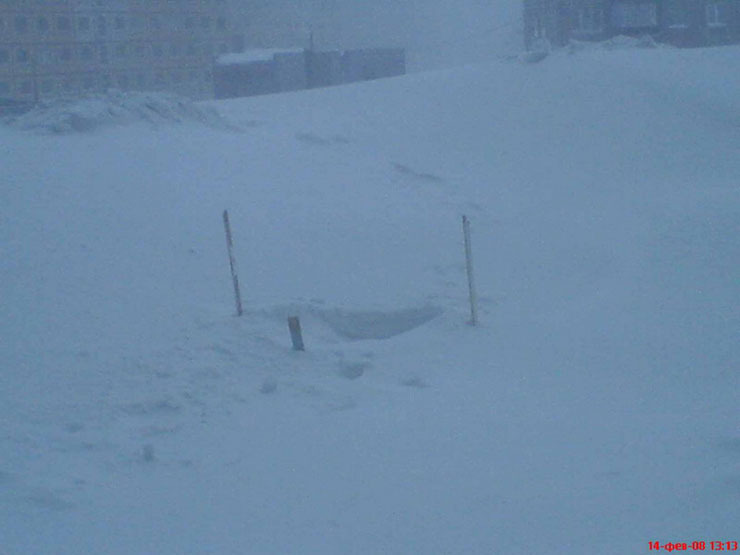 How a siberian toilet looks like? Ok, gotta admit, that’s a LOT of snow. I don’t think we have that much anywhere else put Lapland, and even there it won’t come with one go. It’s funny how it turns valleys in plains, making it difficult to recognize fells and canyons in Lapland. Use to work there as a landsurveyor / mapmaker. Great! I think he’ll be at the office in time to see evening news about “black snowstorm”. Dont step on my canabis plant its right here between 3 sticks! I lived in Norilsk, so when the spring comes people use the kettles with hot water to thaw out very thick ice from the home windows. 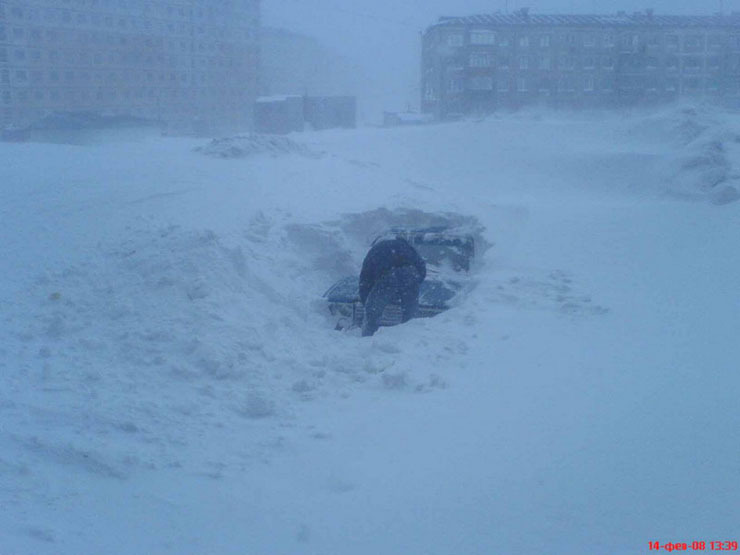 What do people do for a living in Norilsk? If we has snow like that here in New Jersey, everything would stop. For one thing, no one could get to work if they couldn’t drive. We have so many roads and parking lots that there would be no place to move the snow – it would have to be loaded onto dumptrucks and driven to the ocean. Do people just hunker down at home? Or does everyday life at the shops ans factories and offices go on, because everyone is used to it? How much snow is that, and how often does it fall? And why would anyone build a city there to begin with? The way of living is quite hard but for a very good wages. Is Norilsk still a closed city? there’s very much oil and other minerals in siberia that’s why the cities are built….and just because its Russia and we live and build on our land no matter what. Same qeustion why Nigeria built cities in middle of desert? I don’t understand why you are representing russia if your name is fromukrainewithlove. What dont you understand? Ukraine and Russia are linked forever in history and culture. And because he is from ukraine you expect him to hate Russia? Why? Comrade, you have proven to be a nice person. I myself am 3/4 Russian and 1/4 Ukrainian and hope that both countries will someday become one country, or at least be friends because I too think same people more or less. I used to live in north russia where it got to -40 in winter. You could get frost bites just by holding the steering wheel while trying to start the car. I lived there for more then 25 years. All my childhood was there. It was not so bad. So many snow is not everyday. Toilet we had in normal warm toiletroom. And walking outside when – 62 C. is not impossible. In Soviet times it was romantic city with friendly and optimistic young people. We do this in the northwestern US, too. It’s the easiest way of letting the snow plow drivers know where your vehicle is. The chemical reaction in any traditional car-battery is inhibited by low temperatures. It still happens, but forget the 400 amp or 600 amp load. The chemicals don’t have a nationality. Get the best battery you can buy in the West down to -60ºF. You’ll need to light a match to see if your lights are on. I lived in NW Minnesota until I was 8, and I still have to say that’s a LOT of snow in those pictures. You have to love it (at least sometimes) or you’ll go NUTS up there. That’s a LOT of snow. Best regards.